All the energy that goes into a new perfume is wasted unless you can sell it. Perfume is beautiful. Creating perfume is an art. There is no better way to gain a deep appreciation for perfume that to get your hands on the raw materials and take up the challenge of creating your own scents. But unless you can sell what you make it remains but an expensive hobby. Good marketing allows you, the creator, to go beyond the hobby and share what you have created with the world -- and reap the profits that are yours for sharing it. "The retail price of a bottle of perfume is largely determined by the environment in which it is sold." How Do You Sell Your Unknown Perfume Successfully On The Internet? Can you put together a celebrity fragrance deal? 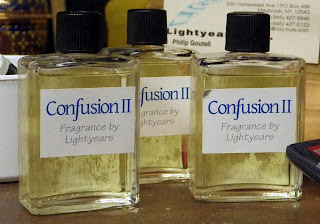 If you've been following my blogs you know I've been working on a scheme to sell my "Confusion II" fragrance. I promised updates and, in time, an exposition of the full business plan for the project. In the past I've been fortunate in the people I've been privileged to work with. I want, once again, to find one of those special people -- a person who, with minimal guidance, can make things happen. But once again I'm reminded that these people are not so common, even in an environment where a great many people are seeking jobs or money making opportunities. It has been a while since I've been in the hiring mode but now it's all coming back to me. Getting the right person really does matter. Fashion advertisers pay big bucks to the "right" fashion models -- because they sell the goods. They help ring up sales many times what they are paid. Likewise for athletes. It's not just about being good. It's about being special and bringing in revenue for the team owners -- many times more than what they are paid. I've done it myself, hired the wrong person, because it seemed easy and getting the people I really wanted just seemed so hard. But now I'm sitting back a bit. Putting the rest of the project on hold while I spend some time and effort recruiting one special person who I really want to work with. I'm betting that in spite of what seems like an annoying delay, the results will be worth my patience. If you want to follow what I'm doing, try this link. I've been writing about my "Confusion II" project for what seems like months now. The project involves a small marketing test which I hope will lead to a larger opportunity. I had written that the launch would occur mid-January. The program launched yesterday -- on time, on plan, and on budget. After pulling the trigger, so to speak, I noticed that, to date, the program has moved along smoothly with no trauma, no unexpected expenses, and no last minute discovery of an unanticipated blockade. I believe this "on time, on plan, on budget" was the result of three factors and I would like to share something about them with you. First, the SIZE of my project was strictly controlled. My plan called for the production of a small number of bottles. (This could easily be scaled up in the future.) I made as much use as possible of materials I already had on hand, many left over from other projects. Development time, from conception to finished bottles, took just over two months -- as planned. Timing was set to avoid the Christmas holiday shopping season, which now runs from mid-November through the end of Decembe and thus the scheduling of the mid-January launch date. For this fragrance, trying to sell into the holiday season would NOT have been an advantage. The quantity of bottles I produced was large enough for me to test my marketing concept -- but no larger. In other words, my test was as small as I could make it but not so small that I wouldn't be able to make projections from the data I captured. Next, the project was broken up into a number of very simple steps, as per the original plan. This resulted in checklists for the development of the fragrance, the development of a marketing "event," and the development of the marketing program itself. Each step on the checklist was clear and simple -- count the number of caps available, count the number of bottles available, check whether there is enough perfumer's alcohol on hand or whether more will be needed, and so on. When each task is accomplished, it is checked off. Finally, each step was given a completion date. For the fragrance compound, a month was allowed for it to age and another month for mixing thoroughly after alcohol was added. Producing a label design took only an hour or so but it too received a deadline. If, in setting a completion date for an item, you find yourself unsure how long that particular step will take, it's time to examine that step for the possibility that you might not UNDERSTAND what it requires. Studying that step, you may discover that you can understand it better by breaking it down into several smaller steps. Remember, you're doing all your preliminary planning on paper, which is cheap. Getting stuck in the middle of an ongoing project can cost you money you shouldn't have to spend. Setting deadlines forces you to think very carefully about every little detail that your project will require. The more attention you give these details before you get started, the smoother your project will go once you do get started. That my "Confusion II" project has gone smoothly I attribute to the planning, the planning that was done before I "went into action." Now, having launched, I can start tracking my results.